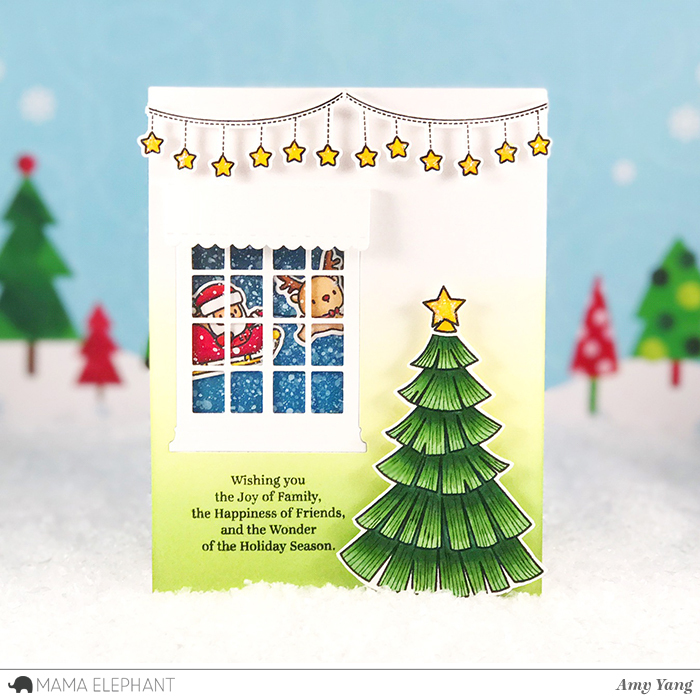 Today, Mama Elephant Design Team is highlighting Holly's Snowflakes stamp set. This set features a beautiful array of intricate snowflakes that will be perfect for your Holiday projects. I made a shaker card using the adorable A Cookie Christmas set to create my scene and used Holly's Snowflakes for a snowy background. To begin, I colored the images with Copic markers and cut them out with coordinating dies. I added Wink of Stella for sparkle and Glossy accents for shine and dimension on some of the images. For the background panel, I die-cut Bristol cardstock to an A2 size panel and inked it with Distress Inks in Wilted Violet, Milled Lavender, and Peacock Feathers. Once dried, I applied anti-static powder, stamped the snow flakes with Versamark ink and used white embossing powder that was set with a heat tool. To create my window, I trimmed white cardstock to an A2 size panel and die-cut it with the frame from Lafayette creative cuts. I then trimmed heat resistent acetate little larger than the window and stamped the sentiment "Merry Christmas" from Sentiments From A Yeti with Versamark ink and applied silver embossing powder that was set with a heat tool. Prior to stamping, I applied generous amount of anti-static powder. Next, I adhered the acetate to the back of the window panel. To finish, I mounted the window panel to the background panel with two layers of foam adhesive after adding some sequins. Then, I adhered the colored images to the card front. Thank you for stopping by today. Make sure to visit by Mama Elephant blog for more inspiration from the Design Team. Hello, everyone! 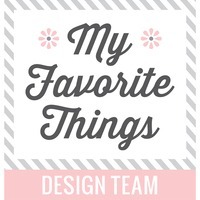 I'm here today with my last post as a guest designer for My Favorite Things. 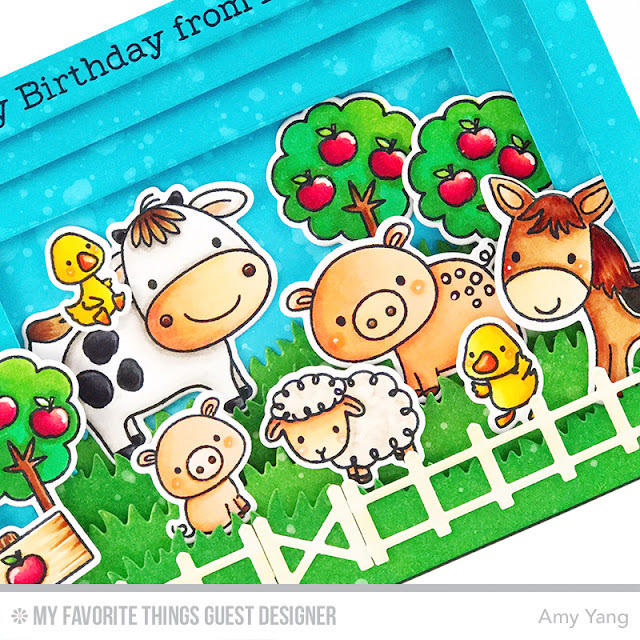 Today, I have a fun farm themed birthday tunnel card to share with you. 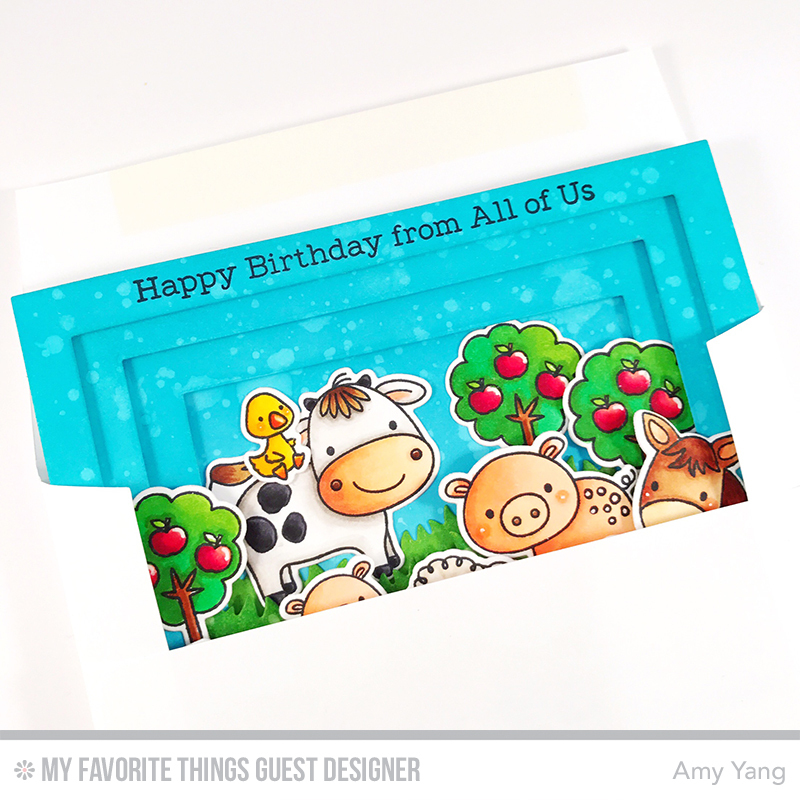 It features the new and adorable Animal Farm stamp set, along with the A2 Rectangle Stax Set 1 and 2 Die-namics. To begin, I stamped all the images with Black Licorice Hybrid Ink on smooth white cardstock and colored them with Copic Markers. I cut them out with their coordinating dies. Please Note: I stamped the apples to the trees and the sign before coloring. I also used a white Gelly Roll Pen to add accents here and there. 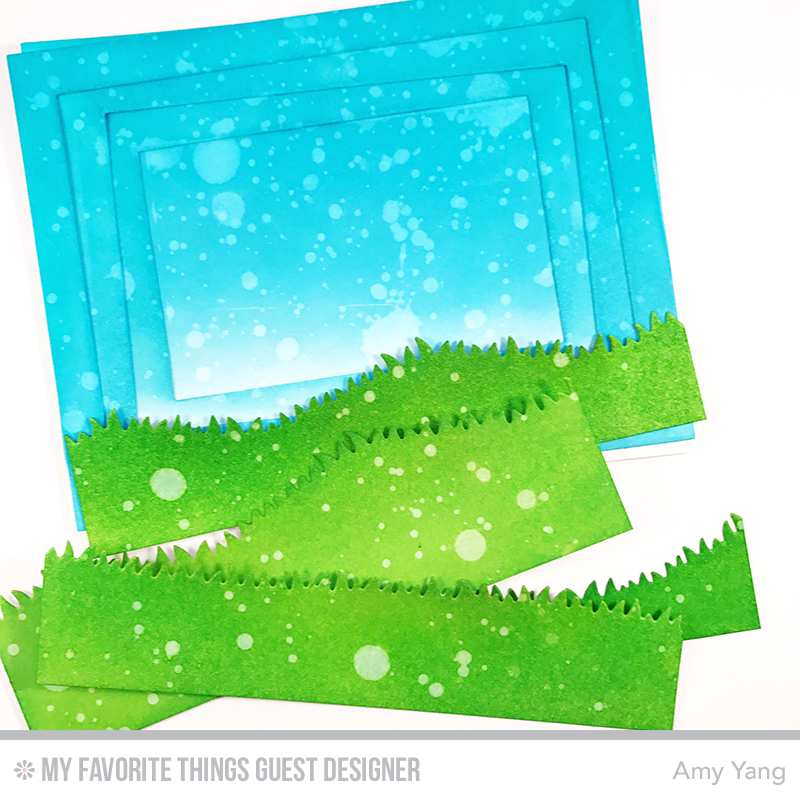 Using the Grassy Hills Die-namics, I die-cut four Bristol cardstocks to the width of 5 3/8. The height of the grass went from taller in the back to shorter towards the front. I inked the card panels with Salty Ocean and Peacock Feathers Distress Oxides, and inked the grass with Mowed Lawn and Twisted Citron Distress Inks. I flicked some water to add texture to both. I then stamped the sentiment using black Versafine ink on the top panel. To assemble the card, I adhered the inked solid panel to a top folding card base, and added the tallest grass on top. Then, I attached each layer to make a tunnel as shown in the above pictures with mounting tape. When I was finished assembling, it had three layers of mounting tape. Luckily, even with the thickness of the card, it still fit into an A2 size envelope comfortably . 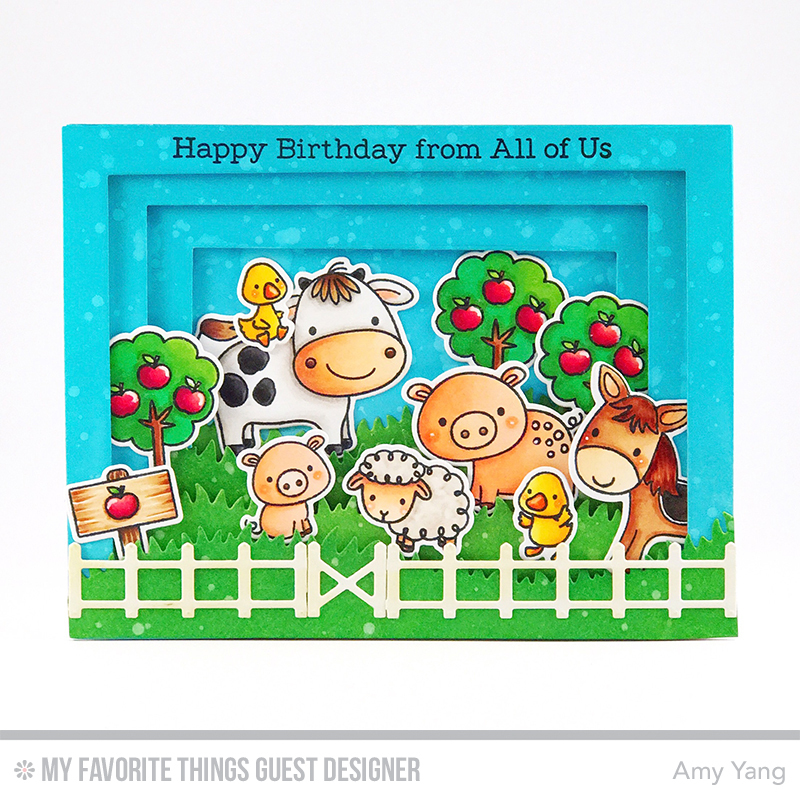 To complete the scene and add more interest, I die-cut white cardstock using the Animal Farm Fence. I inked it with Antique Linen Distress Ink for some color. Then, I adhered it to the card front. Lastly, I arranged my scene and adhered all the images to the card. This tunnel card design can be used with lots of MFT stamp sets to make fun scenes with dimensions. I know I'll be making more of these; I just love the way they look! I hope I have inspired you to give it a try! That's it for today. I hope you enjoyed my post. Thank you to the MFT team for having me as a guest designer this month! 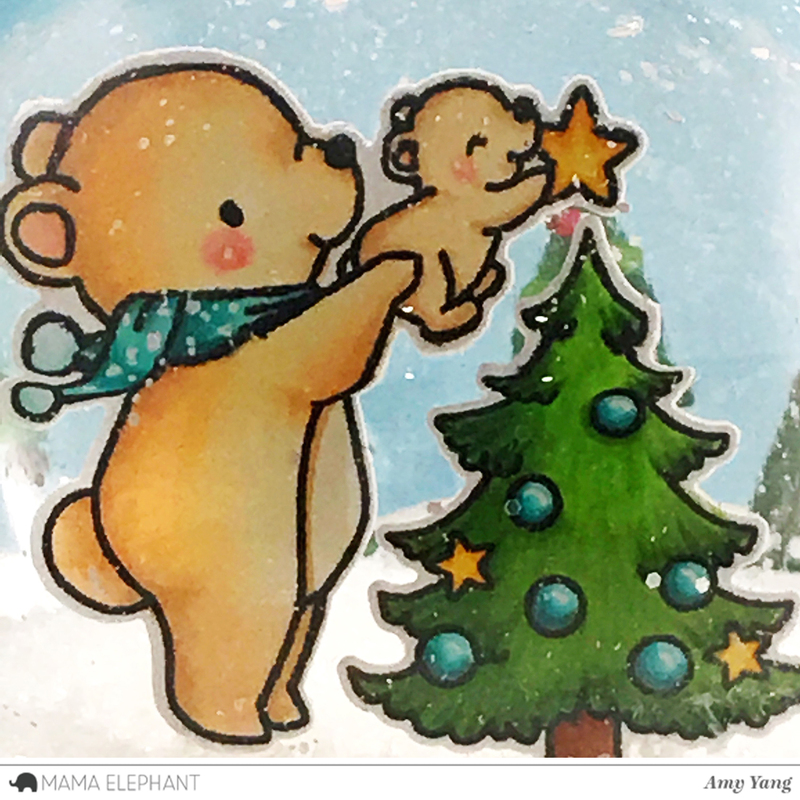 Today, Mama Elephant Design Team is highlighting A Cookie Christmas stamp set. The images on this set is so sweet and adorable it has absolutely stolen my heart. I have a fun color magic slider card to share with you today. The cool thing about this interactive card is that everything is black and white until you pull the tab to reveal a colorful scene. To begin, I stamped the reindeer, bunny and gingerbread house from A Cookie Christmas on masking paper and cut them out. Then, I trimmed Bristol cardstock and acetate to 4" X 5-1/8. Using the misti tool to help me keep the images lined up, I stamped the reindeer and the bunny on Bristol cardstock with black Versafine ink and then placed the acetate on top and stamped it again with Staz On (this is a permanent ink that stamps on acetate) black ink. After, I masked the characters and stamped the gingerbread house and followed that same steps as above. This allowed for the characters to be in front of the gingerbread house. I colored the images that was stamped on Bristol cardstock with Zig Clean Real Brush Pens. I masked the images and the bottom of the cardstock as shown and inked the background using Distress Inks. I first splattered water and then diluted white acrylic paint using a paint brush to added texture and snow to the background. Once dried, I adhered it to a white panel that was slightly larger. Then, I die-cut 3 white cardstock with the frame die from Frame Tags Madison Avenue creative cuts. With the first two, I trimmed around the perforated lines and made a U shape to used as a channel for the tab (see above photo) and I adhered it as shown. Next, I carefully lined up the images to the stamped acetate window, adhered the acetate to the top channel and I adhered the die-cut frame on top of that. I used one of the negative cut from the frame as a tab to hide the colored images. The channel I created allows for the tab to move in and out to reveal or hide the colored images. To finish, I adhered the the panels to an A2 size pattern paper and then to a top folding card base. That's it for today. 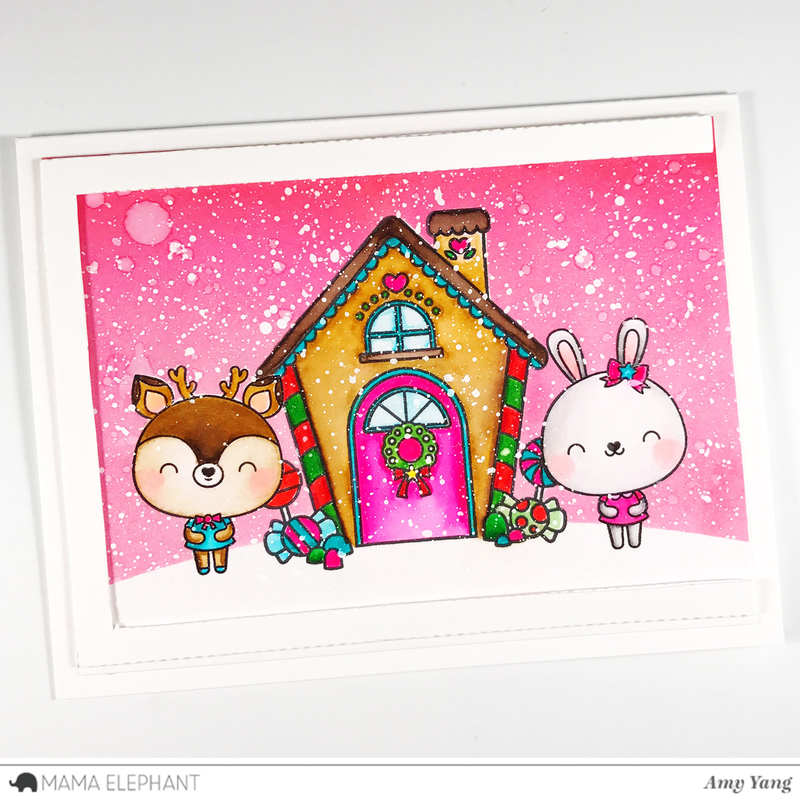 Make sure to stop by Mama Elephant blog for more inspiration from the Design Team using this wonderful set. 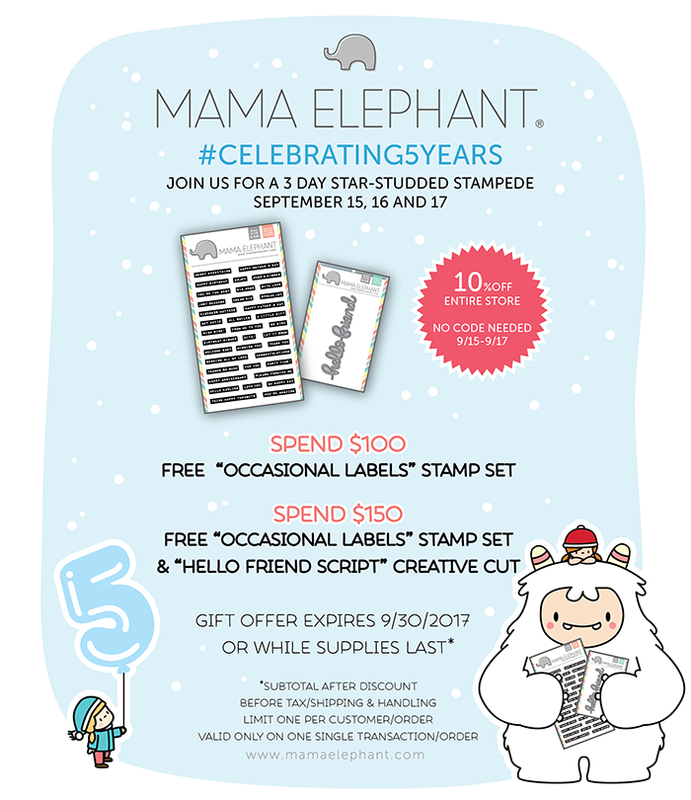 Today Mama Elephant Design Team is highlighting the Season's Wishes stamp set. This essential set includes a gorgeous oversize scripty greeting with sweet companion sentiments for your Holiday projects. I have two Holiday cards to share with you. Both cards are A2 size and I colored the images with Copic markers and used combination of Distress Inks and Distress Oxides to ink the panels. For the first card, I inked the background panel and added splatters of water. Once dried, I adhered the reindeer from Little Reindeer Agenda and Santa Claus on the sled from Little Santa Agenda that I cut with coordinating dies. Then, I flicked some diluted white acrylic paint to make it look like it's snowing. I inked the front panel as shown and die-cut it with the Window Watching creative cuts. Using the same dies, I die-cut white cardstock and adhered the cut out pieces to the front panel. I stamped the smaller sentiment from Season's Wishes with black Versamark ink and mounted the tree from Cozy Christmas and the star banners from Sentiments From A Yeti with foam tape to add dimension. To finish, I adhered the front panel to the background panel with dimensional foam tape. My second project is a fun spinning wheel card that was inspired by Sandy Allnock . If you click on her name, it'll direct you to her Youtube video. 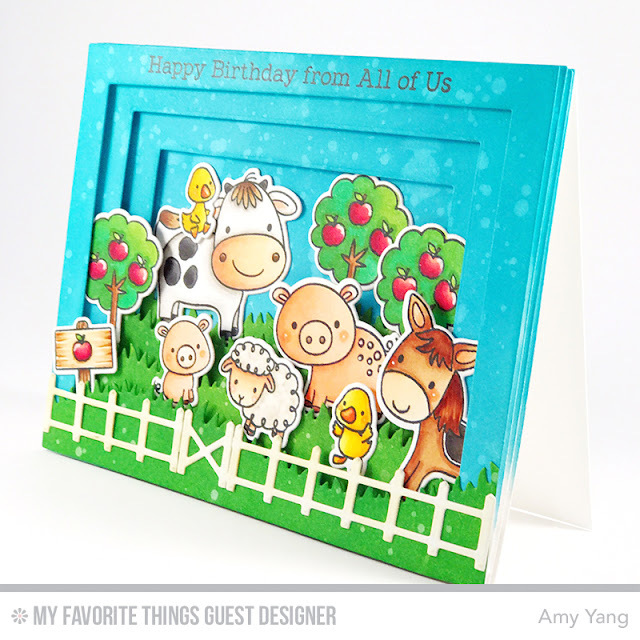 The video will give you detailed explanations of how to make cards like this. To begin, I die-cut Bristol cardstock with the large frame from Peek A Frame creative cuts. Then, on the same panel I die-cut the the circle using the second smallest circle die from Sew Fancy creative cuts to create a window for the wheel. I inked the panel and stamped the snowflakes from Holly's Snowflakes with Versamark ink and added Pearl embossing powder and heat set it. Then, I stamped the large sentiment "Season's Greetings" from Season's Wishes with Versamark ink and heat embossed white embossing powder. To make the wheel, I die-cut Bristol cardstock with a circle die that is similar width of the front panel. I stamped the the images from Little Reindeer Agenda and Little Santa Agenda on post-its and fussy cut them out so that I can do some masking. Then, I stamped the images to the die-cut circle (watch Sandy's video to see how it's done). Just for the Santa and the his two reindeer, I stamped and masked the Santa with the cut out Post-it and then stamped the two reindeer so that the Santa can look like he's standing in front of them. Then, I adhered all the cut out post-it images on the wheel and inked it to match the front panel. After, I removed the Post-its and added splatters of diluted white acrylic paint to make it look like it's snowing. To help the wheel spin, I die-cut white card stock using the smallest circle from Sew Fancy creative cuts. On the circle, I attached a brad in the center and foam tape (see second photo for this project). I adhered the other side of the small circle to the top folding card base. Then, I added the wheel to the small circle with the brad as shown in the photo above. To finish, I added foam tape to the top and the bottom of the card base and adhered the front panel on the top. Thank you for stopping by! 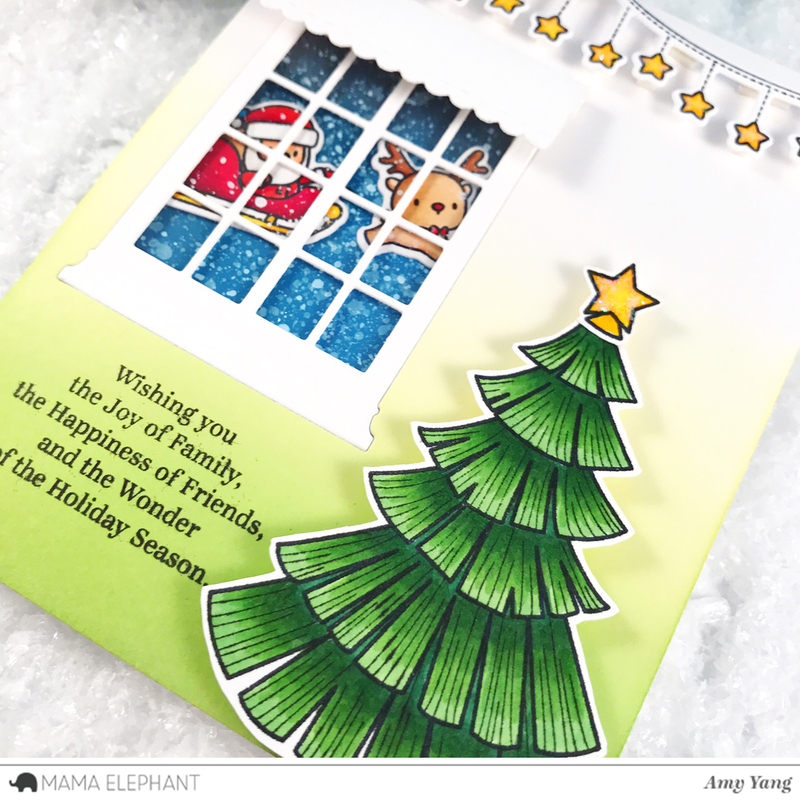 Please visit Mama Elephant blog for more inspirations using the Season's Wishes set by the talented Design Team. Thank you for stopping by. Don't forget to check out Mama Elephant blog for more inspiration from the Design Team. 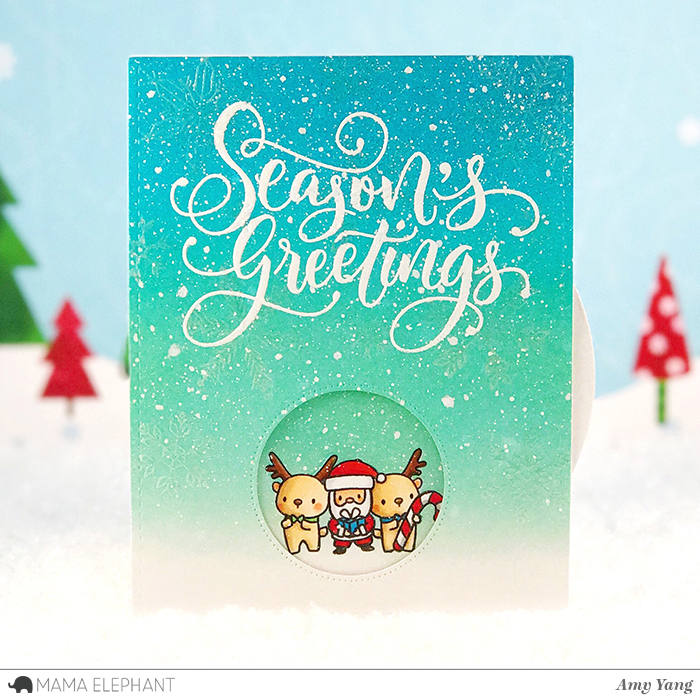 Today, the Mama Elephant Design Team is highlighting a fun and unique sentiment stamp set, Puffy Holiday Greetings. I tried to create a window view of a heartwarming scene with a family of bears setting up for Christmas on a snowy day. The sentiment hanging on the wall completes the scene, don't you think? To begin, I stamped and colored the images with Copic markers and cut them out with the coordinating dies. On the A2 size background panel, I created the living room floor and wall using masking tape and Distress Inks on Bristol cardstock. For the front panel, I used an A2 size white cardstock and die-cut it with the window frame using the Peek a Frame creative cut as shown. Then, I trimmed two heat resistant acetates to the size of the window. I stamped the acetate with the smaller snowflakes from Holly's Snowflakes set with Versamark ink, and applied white embossing powder. I also randomly sprinkled on more white powder to create snow. I used a heat tool to set everything. I adhered the acetates behind the windows. To make the snow on the window sills, I used a snow marker and applied heat to puff it up. I mounted the window frame to the background panel with two layers of mounting tape. For the "Merry Christmas" sentiment from Puffy Holiday Greetings, I stamped it with black ink and cut it out. I added a little green string around the sentiment, and adhered it with the other images onto the card. Some of the images were attached with a double sided tape, and others with a single layer of mounting tape. To finish, I attached the panels to a top folding card base. That's all for today. Don't forget to stop by Mama Elephant Blog to see more inspirations by the talented design team. Hello everyone! Today, I have a cute halloween card to share with you. It features the adorable and non-spooky Trick or Treat Friends from Pretty Pink Posh. To begin, I stamped and colored the images with Copic markers, and used their coordinating dies to cut them out. The candy basket and the spider are from the Halloween Friends set. I used a black A2 size panel to die-cut the window squares from Stiched Duo 3. I die-cut again on black cardstock and trimmed it to make a frame as shown. I inked the front panel with a brick stencil using Picket Fence Distress Ink. After, I adhered the frame on top of the window. I inked the background panel with Fossilized Amber and Spiced Marmalade Distress Oxides. I stamped the sentiment with black Versafine ink. I assembled the card by mounting the front panel to the background panel with foam tape after adding the boy. I attached some fake spider webs to the front panel to add more fun and interest. Then, I adhered the trick or treaters and the spider. To finish, I attached the panels to a top folding card base. That's it for today. Thank for you stopping by and happy crafting! 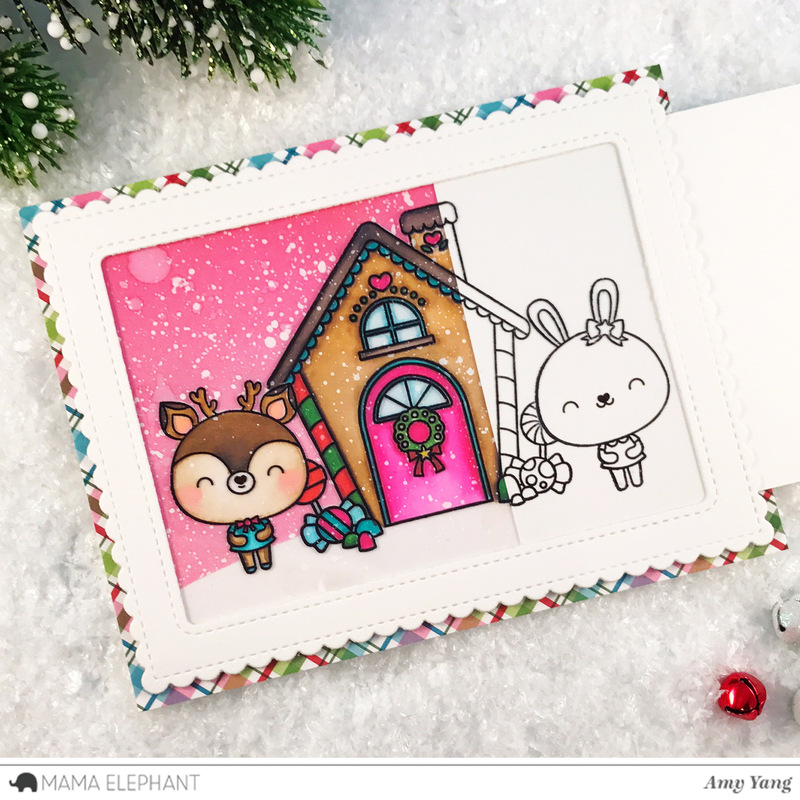 Today, the Mama Elephant Design Team is highlighting the adorable Little Reindeer Agenda stamp set and its coordinating creative cuts. To begin, I colored the images with Copic markers and cut them out with their coordinating dies. I made the front panel by die-cutting Bristol cardstock with the large cross-stitch border die from Sew Fancy Creative Cuts. This give me a perfect A2 size panel. Then, I stamped the sentiment "Happy Ho Ho Ho-lidays" from Puffy Holiday Greetings with brown ink, and heat embossed it using pearl embossing powder. I used the puffy sentiment to represent the tree trunk. I used washi tape to make a large triangle on the front panel. I inked the inside of the triangle with Mowed Lawn and Citrus Citron Distress Inks, and added flicks of water for a textured look. To finish, I mounted the little reindeer on the tree with foam tape for dimension, and adhered on some beautiful sequins from Pretty Pink Posh to add sparkle and shine. I added the front panel to a top folding card base. 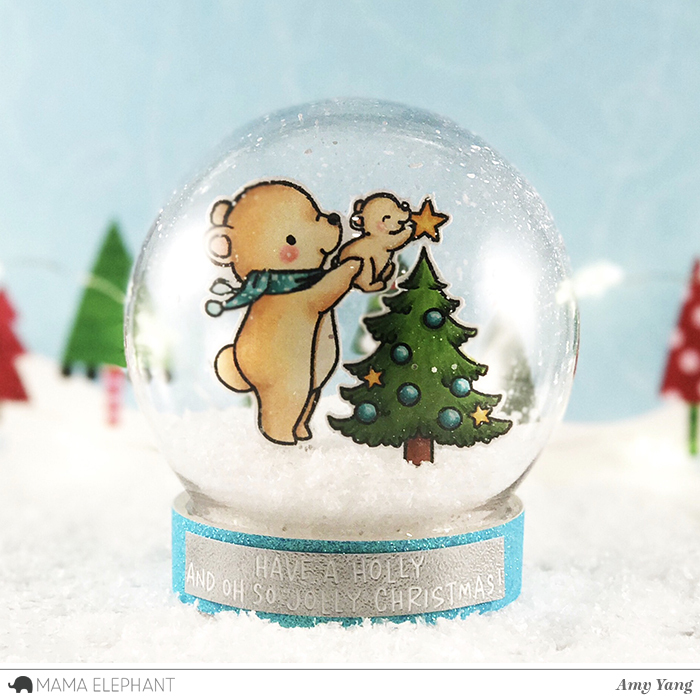 Make sure to stop by the Mama Elephant blog to see more inspirations by their amazing design team. 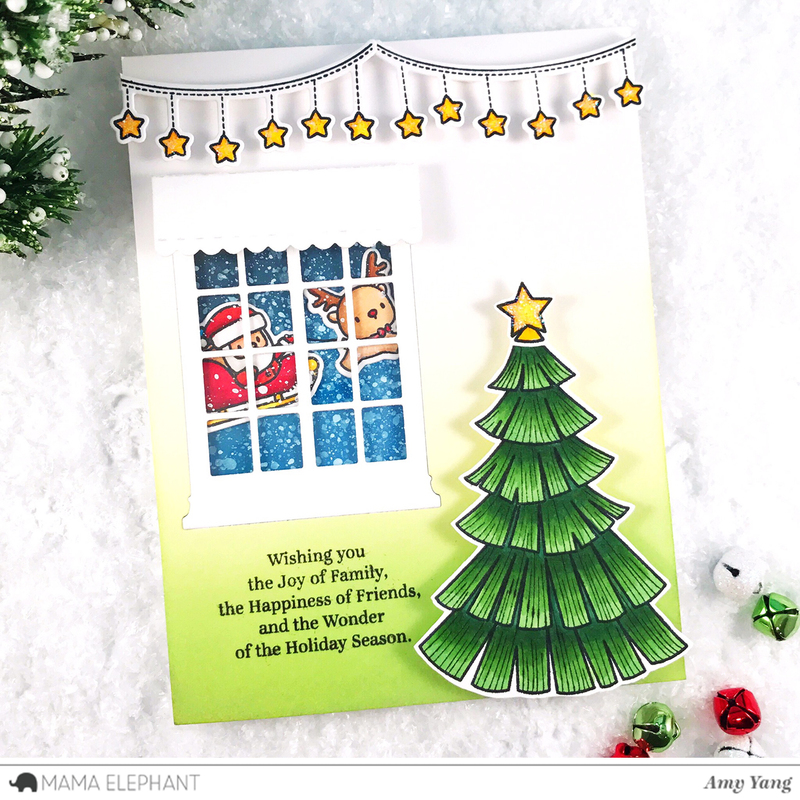 Today, Mama Elephant Design Team is highlighting the sweet A Beary Christmas stamp set and coordinating dies. I have two Holiday themed projects to share with you. First is a plastic snow globe that I purchased from my local craft store AC Moore, and the second is a fun shaker card. To begin, I colored the images for both projects with Copic markers, and cut them out with the coordinating dies. 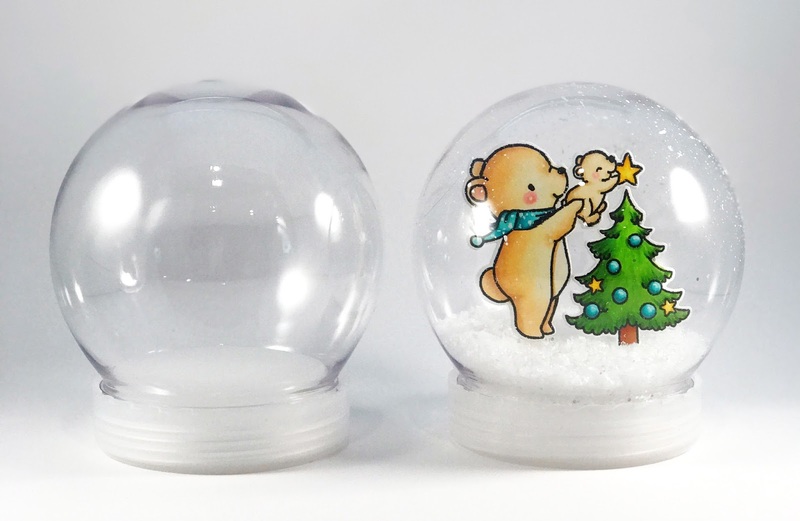 For the snow globe project, I mirrored stamped the images, and adhered them together. This allows you to see the stamped and colored images from all directions. Since this is a paper craft project and I'm not adding water like a typical snow globe, I splattered slightly diluted white acrylic paint with a paint brush to create snow on the outside and the inside of the globe to add more interest. For the snow globe lid, I adhered trimmed glitter card stock around it to make it look prettier. I stamped the sentiment "Have A Holly and Oh So Jolly Christmas" from Puffy Holiday Greetings on white cardstock with Versamark ink. I applied silver embossing powder and heat set it. I trimmed it to a rectangle shape, and adhered it to glitter card stock as shown. To make the images stand inside the globe, I used two small stripes of sturdy acetate and folded it in half and added strong double sided tape to it. I then attached one side of the folded acetate to the images (the acetate goes in between the the images that were adhered together) and the other to the base of the globe. I added glitter and fake snow inside the globe. For the second project, I die-cut white cardstock with the outer frame from Framed Tags - Hexastar. Then, I die-cut the card stock again with the hexagon frame also included in the set to make my window. I trimmed the acetate slightly larger than the hexagon frame, and stamped the sentiment "Merry Christmas" from Sentiments From A Yeti using Versamark ink. I then heat set it using white embossing powder. I added white dots with a white Gelly Roll Pen to create snow. I adhered the acetate behind the window. For the background panel I trimmed Bristol cardstock and inked it with Picked Raspberry, Wilted Violet Distress Oxides and Picket Fence Distress Inks as shown. I added splatters of water for a distressed look. I mounted the window panel with two layers of foam adhesive (after adding the glitter) to the background panel. To finish, I adhered the images to the front then to a top folding card base. 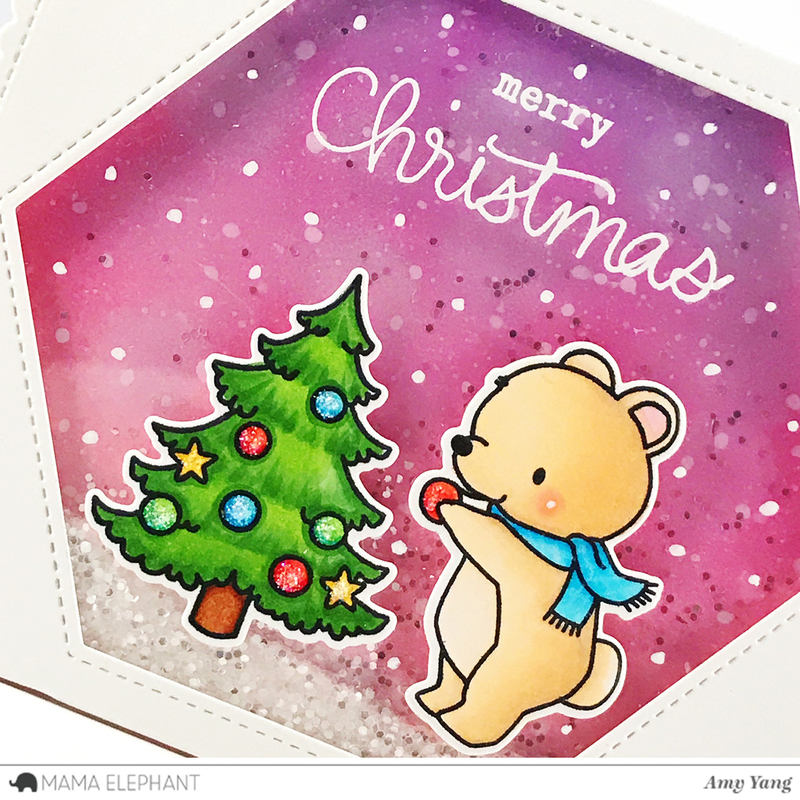 A Beary Christmas stamp set and coordinating dies. I hope you enjoyed today's projects. 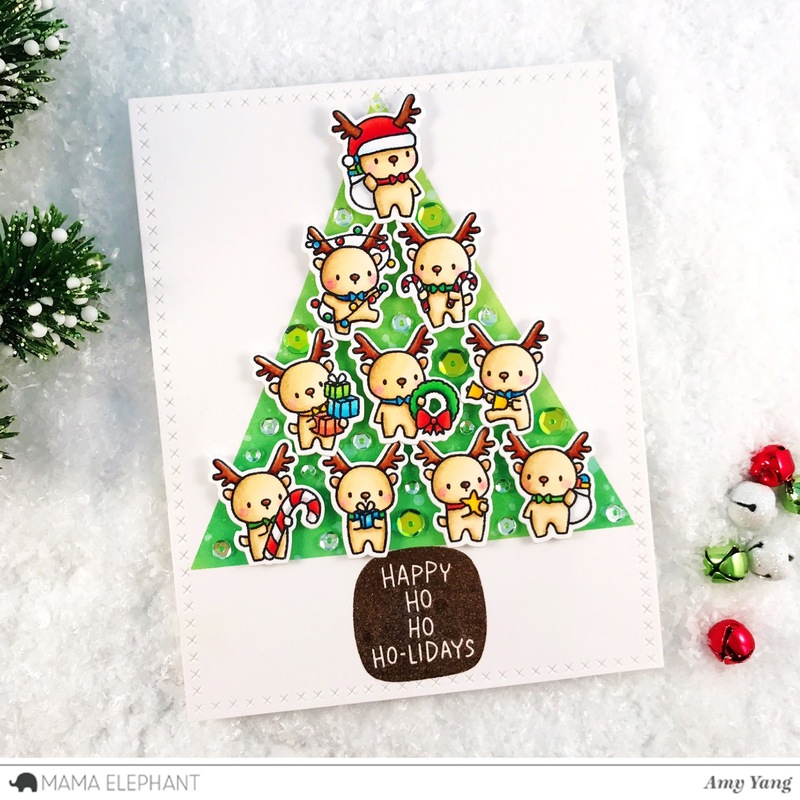 Make sure to stop by Mama Elephant blog to see more inspiration by the design team using this adorable set. 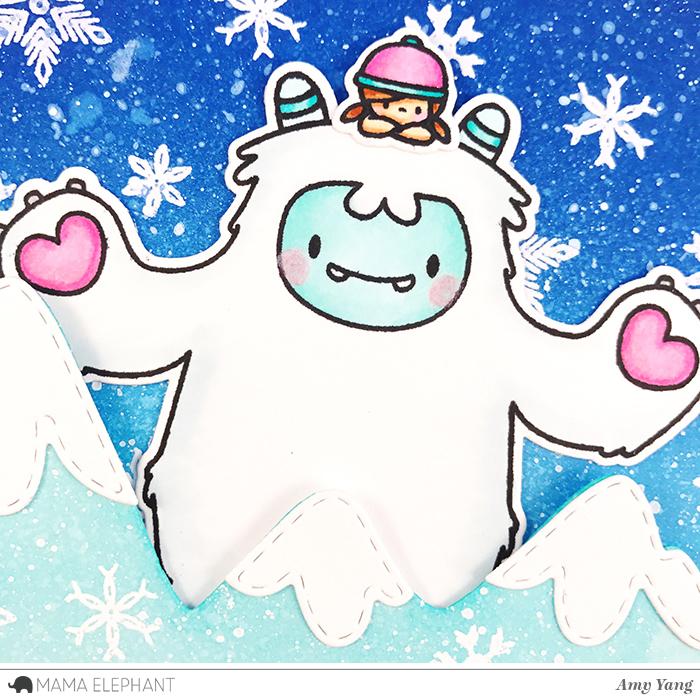 Today is the first day of Mama Elephant Stamp Highlights and the design team is showcasing the new and lovable Me And My Yeti set. To begin, I colored all the images with Copic markers, and cut them with their coordinating creative cuts. Then, I inked an A2 size Bristol cardstock with Picked Raspberry and Spun Sugar Distress Inks. After, I die-cut white cardstock with Snow Capped Mountains Creative Cuts and Landscape Trio Creative Cuts. I just love using the mountain die with the Yeti. I think it really helps to create a fun scene. I inked the snow capped mountains with Salty Ocean and Tumbled Glass Distress Inks. I splattered water and white diluted acrylic paint using a paintbrush to add snow-like texture to the card panel and the mountains. Once it dried, I applied anti-static powder to the card panel, and stamped the sentiment from Sentiiments From A Yeti with Versamark ink. I used white embossing powder that was set with a heat tool. To assemble the card, I adhered the card panel to a top folding card base, then the mountain, and lastly the two stitched snowy hills. Next, I adhered the cute little companions and the trees. You can just adhere the Yeti, but I decided to make this card interactive by making the Yeti wobble using some craft wire (this can be replaced with store bought Action Wobble Springs). 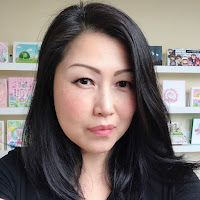 Don't forget to visit Mama Elephant blog to see other wonderful projects made by the design team. 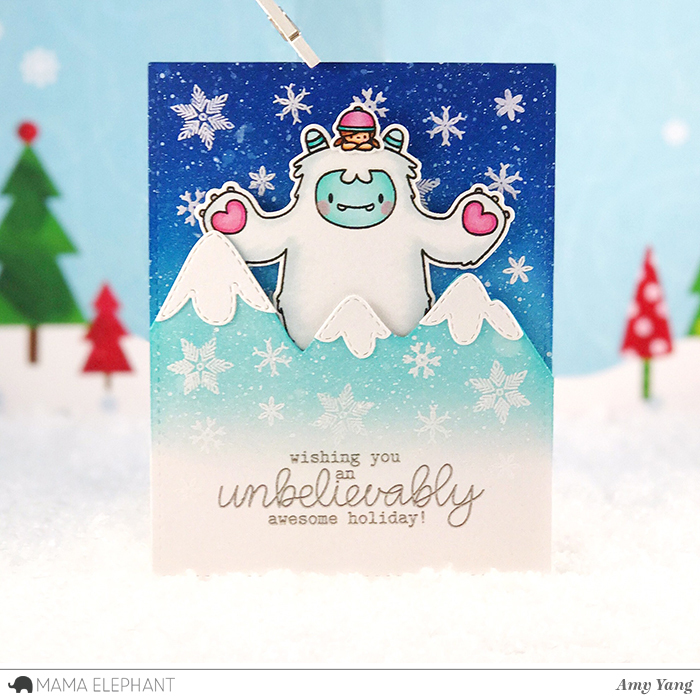 Today is the second day of Mama Elephant Stamp Highlights and the design team is showcasing Sentiments From A Yeti set. 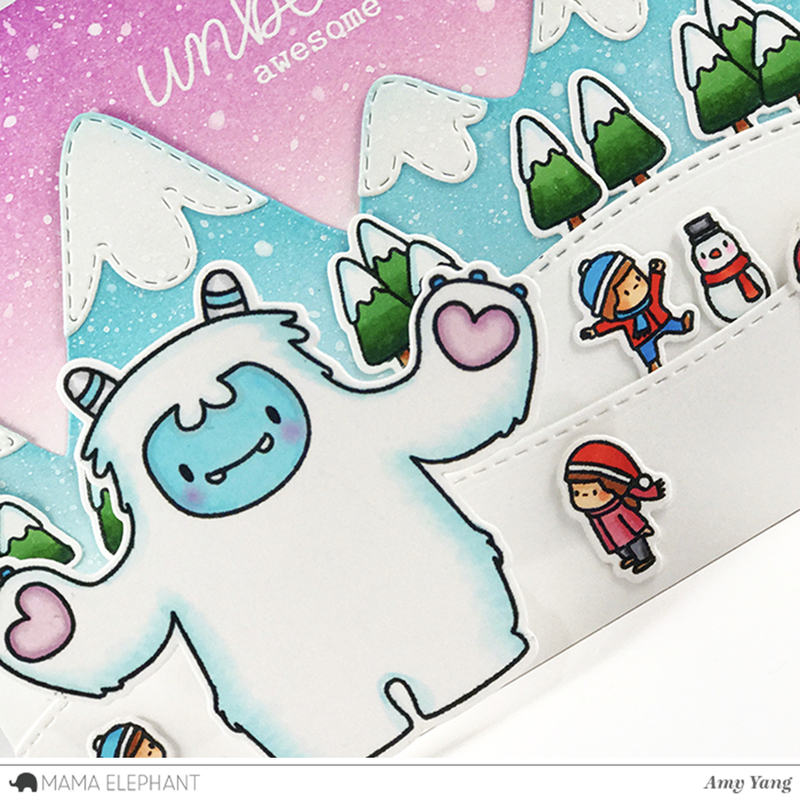 This wonderful set goes with the Me And My Yeti set and it includes some punny sentiments along with banners that fits in between one of the Yeti's arms. To begin, I colored all the images with Copic markers, and cut them with the coordinating creative cuts. I love the way this Yeti die-cut, it allowed me to wrap his arm around the mountain. I used white Gelly Roll pen to add little dots to the Yeti's cheeks. Then, I inked an A2 size Bristol cardstock with Peacock Feathers and Tumbled Glass Distress Inks. After, I die-cut white cardstock with Snow Capped Mountains Creative Cuts. I just love using the mountain die with the Yeti. I think it really helps to create a fun scene. I inked the snow capped mountains with Iced Spruce Distress Inks. I splattered water and white diluted acrylic paint using a paintbrush to add snow-like texture to the card panel and the mountains. Once it dried, I applied anti-static powder to the card panel, and stamped the sentiment from Sentiments From A Yeti with Versamark ink. I used white embossing powder that was set with a heat tool. To assemble the card, I adhered the card panel to a top folding card base, and then the mountain panel. 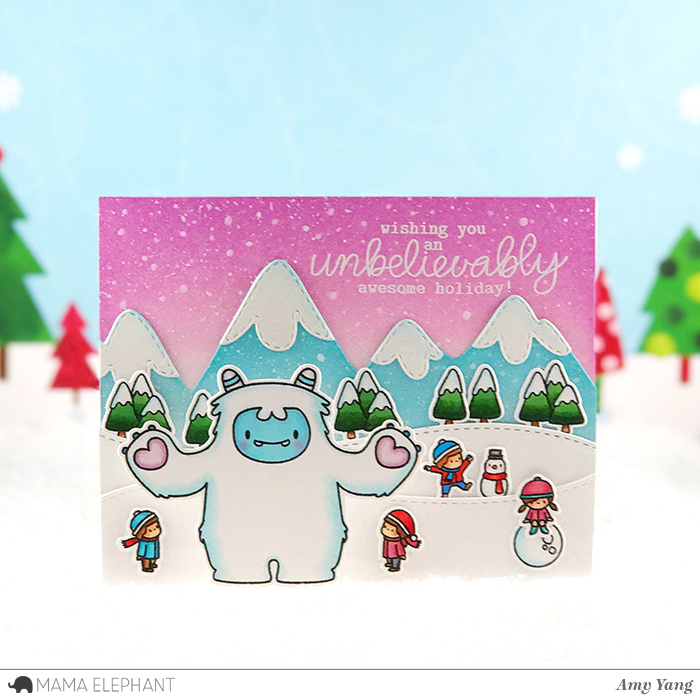 Lastly, I adhered the Yeti holding a little girl behind the mountains and the other images to the the front of the card. 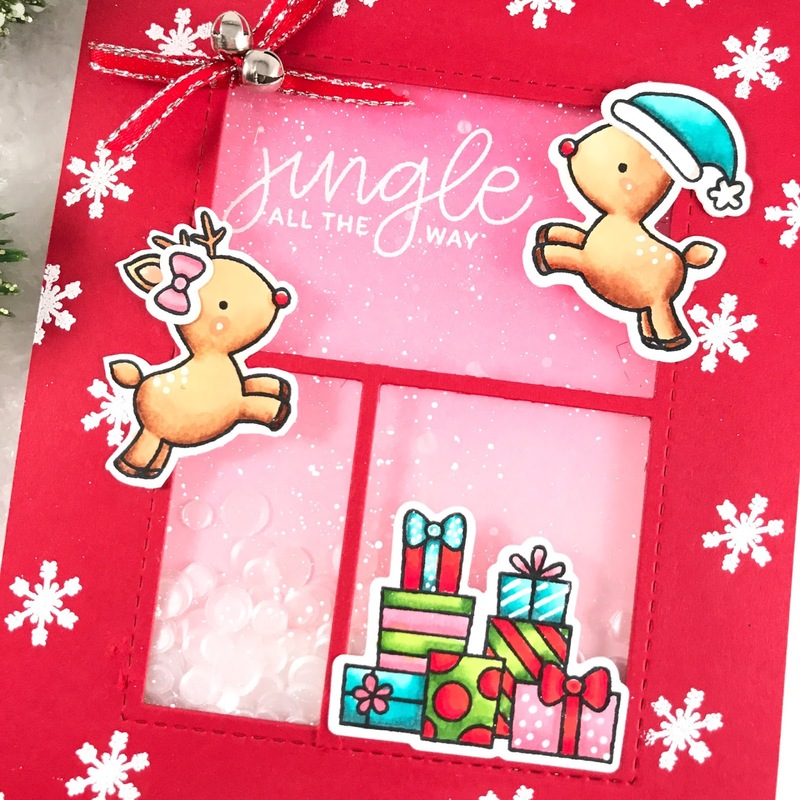 Today, I'm sharing a fun Christmas shaker card using the new Reindeer Friends set from Pretty Pink Posh. To begin, I colored the adorable images with Copic markers and cut them out with coordinating dies. I used white Gelly roll pen to add some accents. I created the background by inking an A2 size Bristol card stock with Picked Raspberry and Spun Sugar. I added splatters of water after. Once dried, I applied anti-static powder and stamped the sentiment with Versamark Ink. I used white embossing powder and set it with a heat tool. To make the front window, I trimmed red card stock to an A2 size. Then I die-cut the center using the Story Book 1 die. After, I applied anti static powder and stamped the snowflakes from Holiday Pals with Versamark ink as shown. I used white embossing powder and set it with a heat tool. I trimmed acetate slightly larger than the window and splattered diluted acrylic paint with a brush to make snow. I adhered the acetate to the back of the window. To assemble the card, I added two layers of foam adhesive all around the edges and adhered it to the background panel after adding the new Marshmallow Confetti Mix. Lastly, I attached the images to the front along with little a bow with bells. That's it for today. Thank you for stopping by and happy crafting! 1. 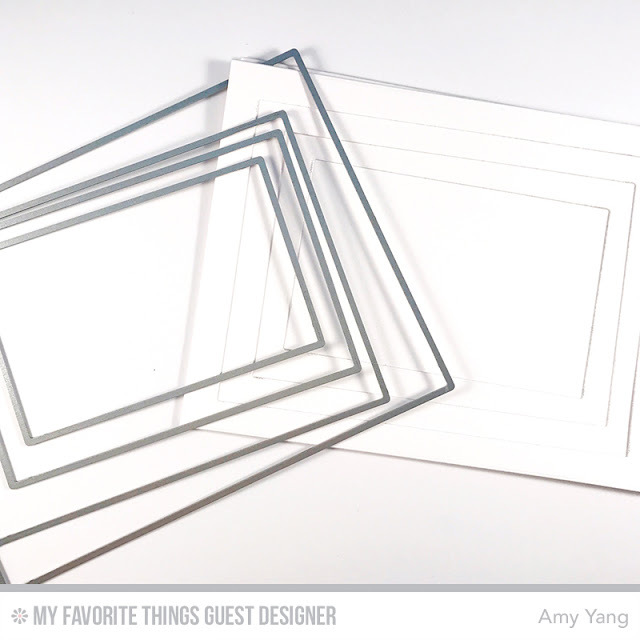 Cut white cardstock to 4-1/4" x 11" and create a top-fold card. 2. 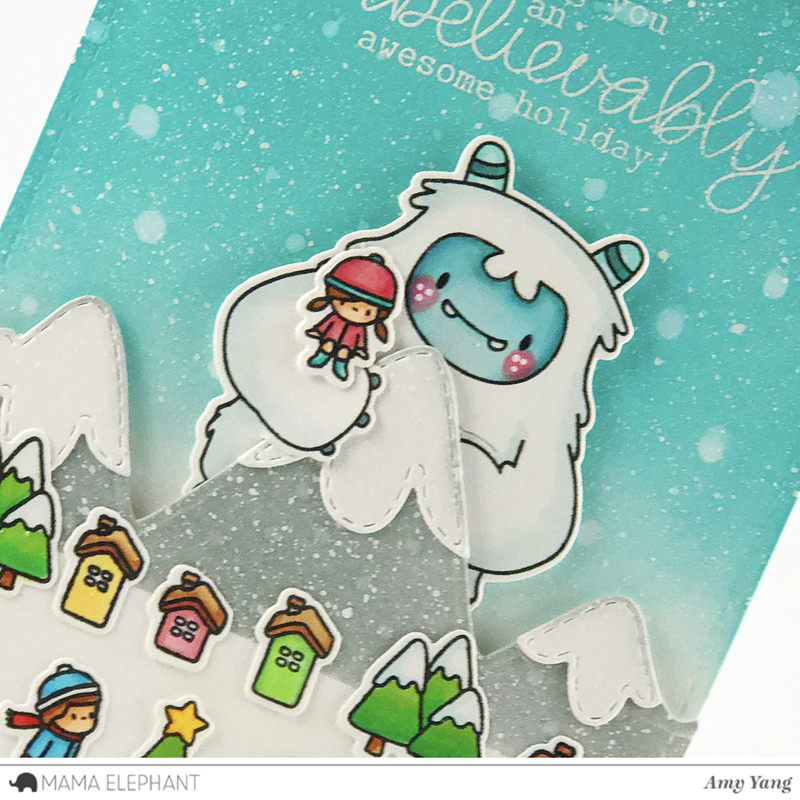 Stamp, color (I used Copics), and die cut the yeti and the little girl using their coordinating dies. 3. Die-cut two Bristol cardstock using the rectangle die from Peek A Frame Creative Cuts. 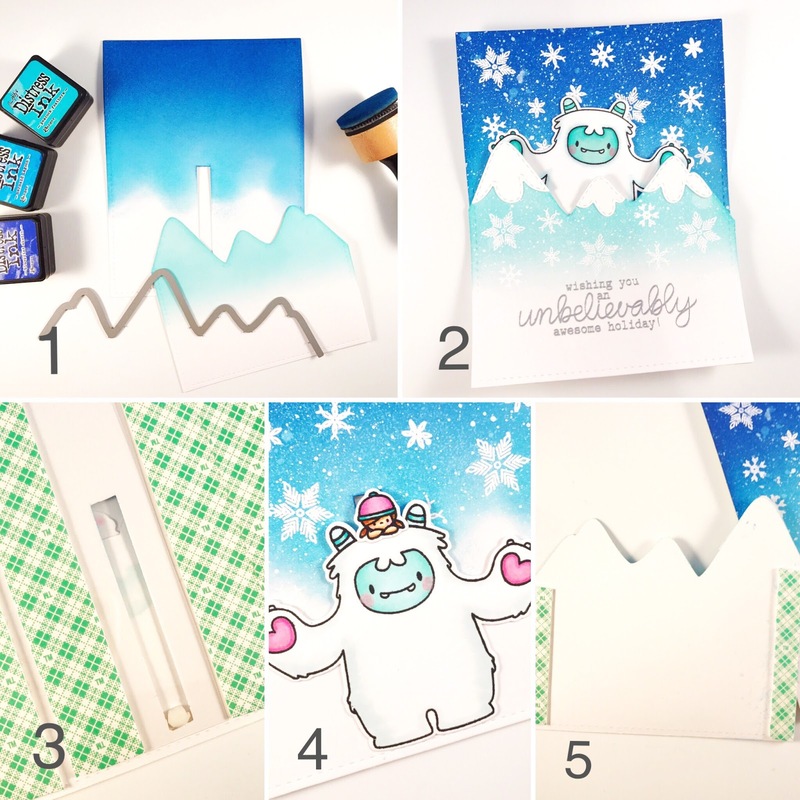 With the first one, die-cut again using the Snow Capped Mountains Creative Cuts. It needs to be slightly taller than the Yeti when he's placed at the bottom of the panel. With the remaining card stock die-cut the snow caps. 4. Trim the center of the second panel to create the slider channel as shown in photos 1 and 3 (you can use a straight slider die to do this as well), making sure it's not taller than the middle mountain. 5. Distress the backgrounds as shown in photo 1, then splatter water with a paint brush or a sprayer. Splatter white diluted acrylic with a paint brush, and dry it with a heat gun. Apply Anti-static powder. 6. Stamp the sentiment with Versamark ink on the mountain panel, use silver embossing powder, and heat set it. 7. Stamp the front and the mountain panel with Holly's Snowflakes, use white embossing powder and heat set it. Adhere the mountain caps. 9. Cut a strip of acetate to fit in the center to around 6" in height. 10. Cut a small round foam tape a little smaller than the width of the channel, see photo 3. Place it on the bottom between the acetate in the back and Yeti in the front. Photo 3 is the back, and photo 4 is the front. This will allow the Yeti to move with the acetate. Test it to make sure it works. 11. Add a thin strip of foam adhesive on the outer edges behind the mountain panel as shown in photo 5. This will give room for the Yeti to move up and down. Then, mount it to the card front, hiding the Yeti. 13. Adhere the front panel to the card base. 14. On the acetate that's sticking out on the top, you can add a strip of paper and write or stamp "pull". I chose to use a white die-cut arrow using the arrow die from Polaroid Fun Creative Cuts.